This post has 2,783 views. I went on a short trip with a couple of friends to the Finger Lakes region of central New York State. We went to visit several beautiful state parks in the area, the scenic Cayuga Lake, a winery, and Ithaca/Cornell University. I had a great time on the trip and I think my friends would agree, although one or two of my friends may have preferred to have walked less. Here are the highlights with some photos. Most of the photo credits go to my friend KW as he is the guy with the DSLR. 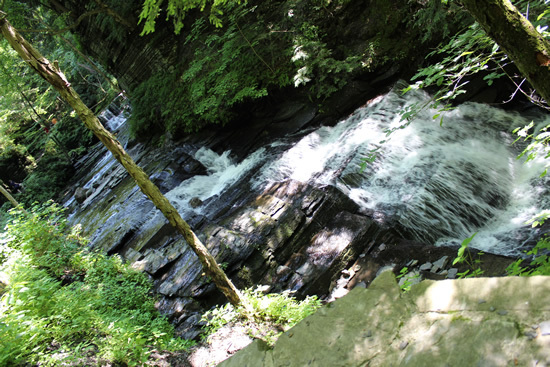 Our first destination was Fillmore Glen State Park which is located about half an hour to the north of Ithaca, NY. 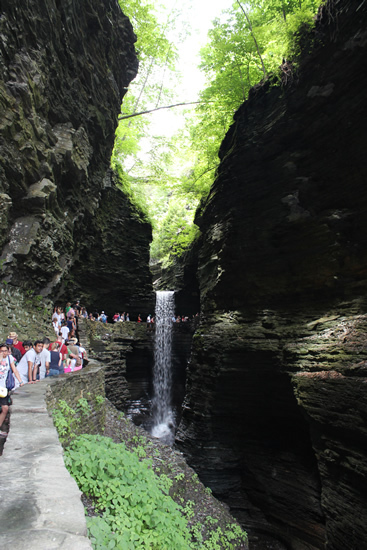 Fillmore Glen and most of the subsequent state parks we visited during the trip are built around scenic river gorges. Fillmore Glen is the first one so it was the “base case” to which I would compare the other parks. 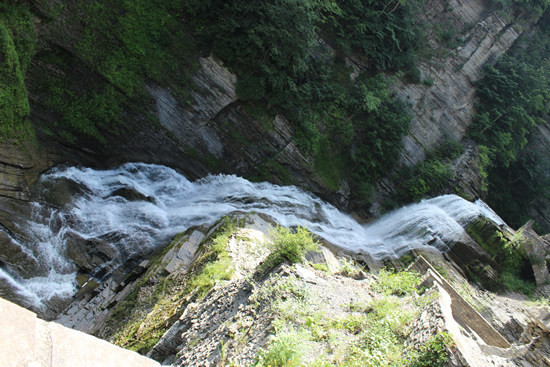 The park features a gorge lined by shale rock on the sides and features many small waterfalls along the way. The thing that stood out about Fillmore Glen when compared to the other state parks in the region is that there were many small bridges crossing the stream, and that it’s fairly easy to climb down from the trails to the stream. I thought it was a beautiful park and it was a good start for the trip. Some of my friends were complaining about walking for too long and the heat, and all I can say to them is that they should have slept earlier the day before and should do more cardio at the gym. The scenery would only get better from this point. 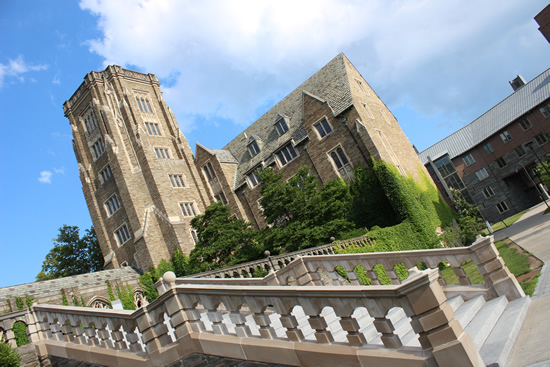 Cornell sure has some nice buildings. More Nice buildings at Cornell. 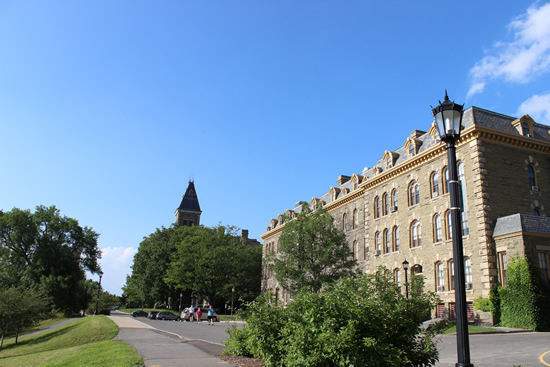 Located in Ithaca, NY on the south end of Cayuga Lake (the longest of the Finger Lakes), Cornell University is a member of the Ivy Leagues and consistently one of the top-ranked universities in the world. The campus is located on the east side of Ithaca on the hill with a great view of Cayuga Lake, and I have to say that it’s probably the best university campus I’ve been to so far. The campus is huge, with several wide open plaza and hills. The buildings are a nice mix of castle-like stone walled, classical buildings and new, shiny modern architecture. The campus is so big that we got tired after visiting less than half of the areas. Maybe I’ll check out the rest the next time I go to Cornell. The only downside I could think for such a large campus is that it might be a little hard to get around during the snowy winter days, but in the summer the campus is awesome. Other than Cornell, we visited some other places in Ithaca as well. 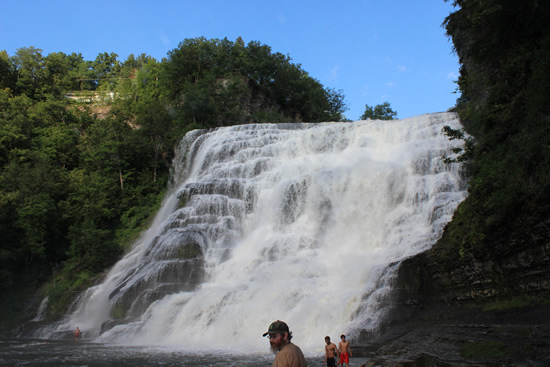 Just down the hill from Cornell is Ithaca Falls, a large and impressive looking waterfall. It’s not the tallest waterfall, but it was pretty wide and had a lot of water coming down. There were a few people taking a dip at the bottom of the waterfall. I left my swimming stuff at the hotel so I didn’t go in, but one of my friends did. Since we are on a Finger Lakes adventure, of course we had to check out the Finger Lakes themselves. In our case, we mainly focused on Cayuga Lake. We visited the lakeside Stewart Park at dusk to take in a view of the lake, and on another day we paddled on the lake on canoes and kayaks. The waters were calm and the weather was great, so it was good paddling even though we didn’t have much paddling experience. We didn’t visit all of Ithaca though, and in particular didn’t really go to the downtown area. We did have a meal or two in the Collegetown area that serves Cornell University. One of the restaurants was okay, the other was not so great. Maybe next time I pass by I’ll check out the other areas in Ithaca. Back to visiting state parks, the second state park we went to was Buttermilk Falls State Park located just south of Ithaca. Buttermilk Falls is another Finger Lakes river gorge park, but the things that stood out in this park was the sloped lower fall at the entrance and the sheer number of waterfalls. I think Buttermilk Falls has more waterfalls in total than the other parks. It was a nice hike through the park. There was also a swimming hole at the entrance, but we chose to swim at the next park in our trip. 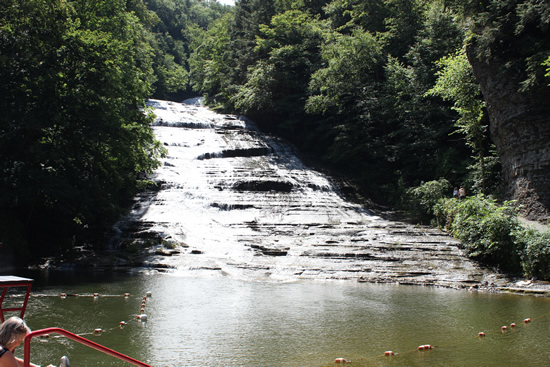 Robert Treman State Park is also located just south of Ithaca, and is yet another river gorge park. 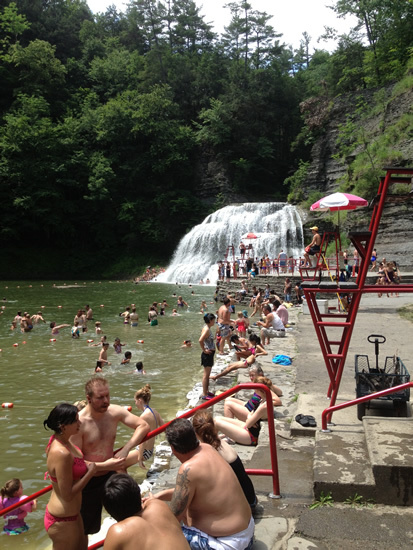 The waters below the Lower Falls of the park is also one of the area’s most popular summer swimming holes, and my friends and I went to take a dip. The air temperature was hot, but the water was colder than expected. It wasn’t cold enough to stop us from taking a little swim though. After taking a dip, we drove to the Upper Entrance of the park to walk a small loop in the Upper Gorge area. The trails at Robert Treman were a little longer than the ones at the other parks, and we didn’t feel like walking an entire 4-5 mile loop. The gorge of Enfield Creek that runs through the park was the largest of the gorges we visited on the trip with tall steep walls rising on both sides of the gorge trail. It’s big enough to make us feel small. Robert Treman also provided the one of the grandest spectacle of the trip in the form of the big cascading waterfall known as Lucifer Falls. Watkins Glen is really pretty.. and full of people. Watkins Glen is a community located at the south end of Seneca Lake, about 30 minutes west of Ithaca, and the state park there is supposedly the most famous one in the region. We went on a weekend and there were a lot of people. Buses full of tourists were being dropped off at the park, and this is quite different from all the other state parks we’ve been to. 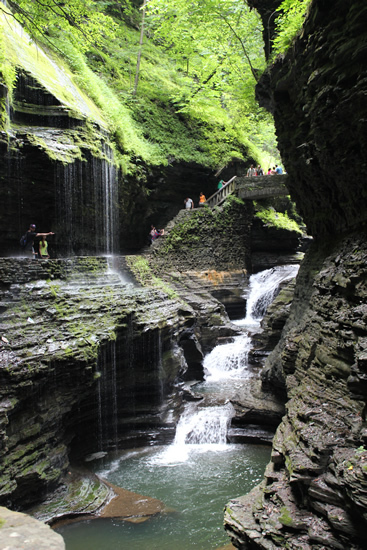 Watkins Glen State Park is yet another Finger Lakes river gorge park, but it is the prettiest of the river gorges we’ve been to. The gorge is somewhat deep and narrow, and you can walk beside, over and even underneath some of the waterfalls. The shape of rocks and flow of the stream and all the plants that are there make for a beautiful scene. Would have been nicer if the park wasn’t so full of people, but people tend to flock to the more well known attractions. More Watkins Glen goodness. The scenery is just so serene and pretty. The last of the state parks we visited was Taughannock Falls, located a bit north of Ithaca near the western shores of Cayuga Lake. 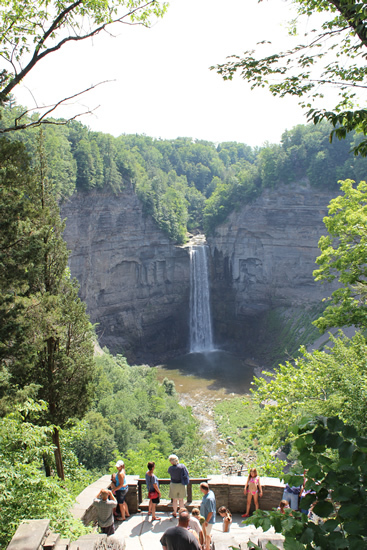 The main attraction of the park is Taughannock Falls, which at 215 ft is the tallest single drop waterfall east of the Rocky Mountains. The waterfall itself and the sheer drop of the rocks on both sides make for an impressive sight. We were a little short on time and didn’t feel like walking anymore, so we only viewed the fall from the overlook. Maybe next time I’ll hike down to the viewing platform that is closer to the bottom of the falls and also visit the portion of the park next to Cayuga Lake. Our final stop on the trip was to a winery for a tour and wine tasting. The Finger Lakes is a wine producing region, and so we couldn’t pass up the chance to stop at the winery. We also took a short tour of the facilities which was interesting, and then we moved to the tasting room. The tasting was $2 per person and each person can sample six different wines. I am not really a connoisseur on wines and didn’t like a lot of the wines I’ve tried before, but most of the wines I tried during testing were pretty agreeable. Some of us even bought a bottle (or two) home for later evaluation. That’s all the highlights for the trip. Traveling with friends like this is quite fun, and it is good to visit these places in New York state which are not necessarily well known nationally or internationally but are very beautiful and worthwhile nonetheless. I’m sure I’ll be traveling some more before winter rolls around again. During the trip I paid $65 for the Empire Passport which gives my car unlimited entries into most New York state parks until the end of next March. Given parking is about $7 at most state parks, I would have to visit 10 times to get my money’s worth and I’ve only used the passport 4 times on the trip (didn’t need to pass the gate for Taughannock Falls). This certainly gives me motivation to find the time to go out some more .